The Point Restaurant at the Black Point Inn in Prouts Neck, Scarborough Maine is a lovely blend of old-world elegance, fine dining, gracious hospitality, stunning ocean views, and inspired cuisine by Chef William Benner, the talent in the kitchen whose focus is on creating a memorable experience for guests utilizing the best of local and regional products. 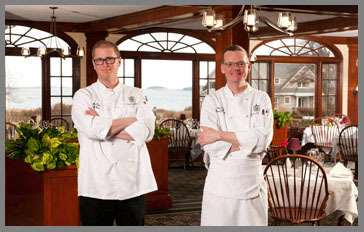 The Black Point Inn and The Point Restaurant are open seasonally from May until the end of October. 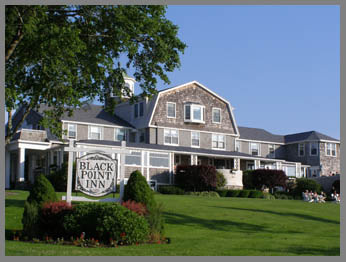 The Black Point Inn, a member of the Historic Hotels of America, opened in 1878 when the area was home to eight seasonal hotels. Today, it is the sole remaining luxury hotel on the peninsula in an exclusive and affluent section of Scarborough known as Prouts Neck. 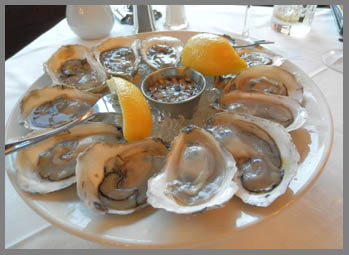 The Inn has two excellent restaurants, The Point Restaurant, a fine dining restaurant offering dinner nightly, and The Chart Room on Prouts Neck, for more casual dining. Edward and I dined at The Point Restaurant during our stay at the Black Point Inn in late June 2013, and although is was officially summer, a fire crackled in the large fireplace to take the chill out of the foggy night and add a bit of romance to the ambience. A spectacular arrangement of white and blue hydrangeas, blue delphiniums interspersed with white chrysanthemums, red flowers, and an American flag in honor of the upcoming Fourth of July holiday, graced a stunning vase set on a table displaying the night's selection of wines offered by the glass. Windsor back chairs flanked tables dressed with double draped white linens and smartly accessorized with silver candlestick holders topped with navy shades and vases of fresh flowers. 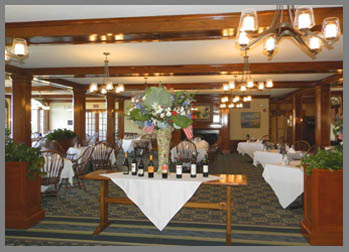 Live plants, antique chandeliers, and wood beams added old-world ambience, paintings graced the cream walls, and the large palladium windows on the right side of the dining room beckoned diners to enjoy the views of the attractive flower gardens on the grounds of the Inn and the breathtaking views of the Atlantic Ocean. Chef William Benner changes the menu nightly and the restaurant's excellent selection of wines offered by the bottle as well as the glass, are perfect to pair with his courses. We began our evening with Bisol Jeio Prosecco Brut - Veneto, Italy NV, with light floral and fruit notes on the nose and an elegant finish on the palate to pair with our appetizers. 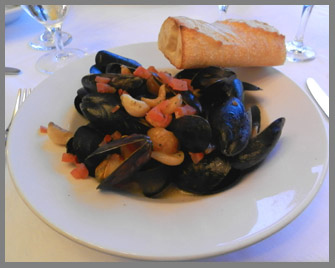 Edward had an appetizer of Prince Edward Island (PEI) mussels, one of Chef William Benner's specials of the night, served in a large deep bowl and accompanied by a baguette to soak up the rich wine, tomato, herb, and roasted garlicky broth. 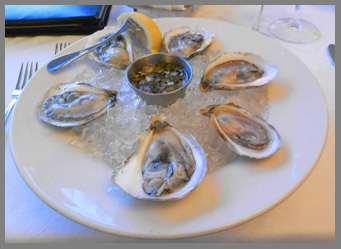 I had a half-dozen of the iced Damariscotta oysters, from the Damariscotta River in Maine served with champagne mignonette, Tabasco, and lemon. These delicate beauties were plump, sweet, and celebrated the goodness of fresh Maine shellfish; topped with the mignonette they were absolute perfection. 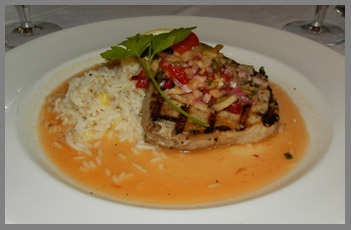 For his main course, Edward had the grilled ahi tuna, also one of the night's specials, beautifully presented on a pool of sauce, topped with fresh fruit salsa, and served with coconut and pineapple rice pilaf. I continued my celebration of the bounty of Maine shellfish with the seared Gulf of Maine scallops presented with frisee, spinach, toasted hazelnuts, orange supremes, and potato crisps, which were micro julienned and deep-fried. 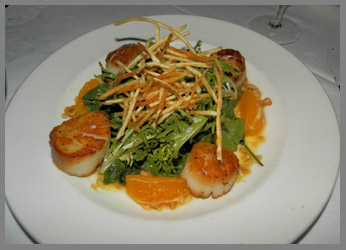 The scallops were enormous, sweet, succulent, seared to give them a golden crust and placed around the generous mound of frisee and spinach, with scattered hazelnuts, orange segments on the plate, and topped with the potato crisps. 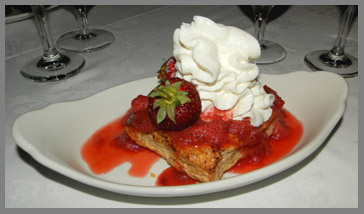 There were many tasty dessert offerings on the menu, however when our server told us that the dessert special of the evening was freshly picked Maine strawberries cooked with rhubarb in a compote, served over puff pastry and decadently topped with Chantilly cream, we were hooked. Visually pleasing, it delivered on the palate, with the fantastic combination of strawberries and rhubarb, a classic summertime favorite. 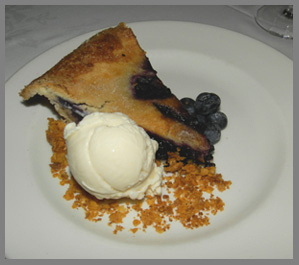 We also shared the Maine blueberry pie served warm with vanilla ice cream, maple crunch, and fresh blueberries. 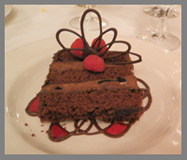 Both of the desserts celebrated the bounty of the summer and the high quality of the local products. Returning the next evening for dinner, the weather was glorious, and perfect for enjoying a pre-dinner cocktail sitting in an Adirondack chair on the Inn's expansive lush green lawn, overlooking the white sandy beach and watching the tide roll in. The Inn has several Signature Drinks on the menu, Edward had a Dark and Stormy cocktail made with Gosling's Black Seal Rum, Captain Eli's Ginger Beer, and fresh lime; for me there was the Black Point Sunset made with St. Germain Elderflower Liqueur, Beefeater Gin, fresh lemon juice, and a splash of grenadine, perfect to culminate a spectacular summer day. Cocktails finished, and comfortably seated in the restaurant, we began our dinner with a shared appetizer of a dozen of the iced Damariscotta oysters with champagne mignonette, Tabasco, and lemon, which were just as wonderful as when I had an order of them the prior night. 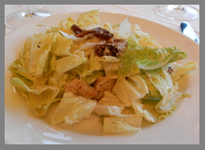 Next, Edward continued with a traditional Caesar salad made with hearts of romaine, herbed croutons, anchovy, and parmesan. 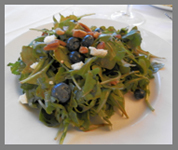 I had the organic arugula salad with Maine blueberries, candied pecans, Vermont chevre, and raspberry vinaigrette, which heralded the rich quality of local and regional products. 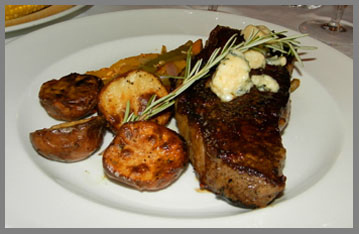 For his main course, Edward had one of Chef William Benner night's specials, strip steak decadently topped with bleu cheese, and accompanied with a mélange of roasted green, orange, and red pepper strips, and roasted red bliss potatoes. 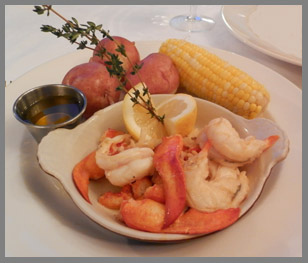 Maine is renowned for its lobsters, and for my main course, I indulged in a true taste of Maine, twin lobsters served lazy man style, which were lobsters removed from the shell and presented in a bowl, and accompanied by red bliss potatoes, corn on the cob, drawn butter, and lemon; fresh, delicious, and simplicity at its best. We ended the evening on a sweet note; for Edward, a chocoholic, there was triple chocolate Neapolitan, a decadently rich dark chocolate cake with dark chocolate filling, with raspberry coulis, topped with fresh raspberries, and a chocolate flourish. 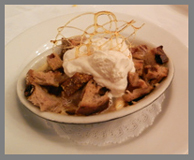 For me there was Cinnamon Raisin Toast Bread Pudding with ginger custard, and caramel Chantilly cream, and a spun sugar garnish. Read the Chefs' Recipes section for the interview with Chef William Benner who graciously provides a delicious taste of The Point Restaurant with his recipe for Lamb Tenderloin with Basil Mash, Olive Tapenade, and Tomato Fondue. 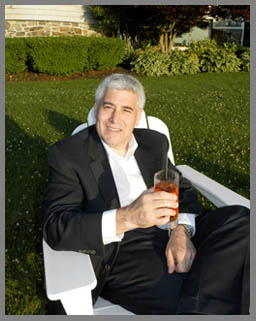 Read about what to do in the Portland, Maine area in the Destinations section.